Where did soil come from? When thinking about the most valuable natural resources, the first things that come to mind are usually oil, gemstones, precious metals, and other similar commodities. You may be surprised to hear that one of the most important and truly priceless natural resources is soil. The soil is thought to have started forming long ago as tiny organisms moved from the oceans onto land. Algae, bacteria, and other microscopic organisms built colonies on rocky shorelines and as they died other organisms grew on top of them. As these layers started to build up, opportunistic lichen spread further onto the rocky surface of early Earth. Rock dwelling lichen release weak acids and played an invaluable role in dissolving the surface of the planet into nutrient-rich soil. This process slowly led to the layers of soil we know today. Modern soil is filled with many of the nutrients required to sustain life. It even sequesters a huge amount of carbon which helps in the fight against rapid global warming. Microscopic organisms throughout history have captured carbon from the air and stored it in the soil in the form of a recently discovered protein called glomalin. 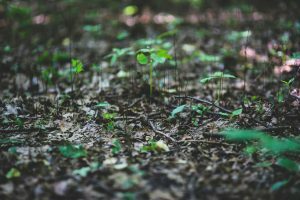 This protein, manufactured by microscopic fungal communities, is able to lock carbon into the soil for up to 100 years. A huge variety of microorganisms have taken up residence inside the soil where they perform their work unseen. Each handful of soil likely contains billions of organisms that work in tandem. The combination of nutrient-rich soil and a diverse community of organisms that work to transform those nutrients into usable forms is one of the key factors behind most of the life on Earth and is something that we have yet to find on other planets. One of the primary drivers of healthy soil is bacteria. There are a wide variety of soil bacteria that perform tasks mostly related to breaking down material. While they decompose matter, bacteria help supply the nutrients necessary for most plant and animal life. Some bacteria are even able to consume hazardous pollutants such as pesticides. The nutrient content of the soil in any given area is heavily influenced by the type and amount of bacteria living inside it. Many plants have developed close relationships with bacteria as well. The roots of many legumes encourage beneficial bacteria by growing small structures on their roots that help shelter and feed the bacteria as it grows. Legume loving bacteria transform nitrogen from the air into a plant-friendly form, and the host plants help feed the bacteria in exchange for nitrogen. Some other types of bacteria are able to infect and damage plants, however. These usually prefer anaerobic and compact soils, so make sure you keep your soil well drained in problem areas. Bacteria populations are also kept in check by nematodes, another important microscopic soil dweller. Nematodes do not break down matter, but instead feed on live prey. Most nematodes eat bacteria, fungi, and similar tiny organisms. A small amount of nematodes feed on plant roots and bark, and can damage plants or spread disease through their feeding- they can be difficult to diagnose, however. If you have a problem area with damage or disease without any other obvious reason why, try planting some marigolds between your plantings. These have been known to keep damaging nematodes at bay. Having generally healthy soil also helps prevent large buildups of nematodes as certain fungi trap and eat nematodes. Microscopic fungi fill diverse roles in soil. Some types of fungi have evolved to work alongside plants in symbiotic relationships. These partnerships usually involve the fungus surrounding a plant’s roots and helping that plant with nutrient and moisture absorption in exchange for nutrients from the host. Fungi are also a food source for many other organisms as they help to break down detritus. The next time you see soil, take a moment to appreciate the vast and powerful ecosystems contained in even the smallest sample. This article was first published in The Sylva Herald. I love what you guys are up too. This kind of clever work and reporting! Keep up the amazing works guys I’ve added you guys to our blogroll.